Snap, crackle, pop–sharp cheddar! Those Krispies are some swingin’ cats! Mix margarine and cheese with flour; add Rice Krispies and mix well. Roll in small ball and mash with fork very thin. They may also be made into little bite-size sticks. Bake at 350 degrees for 12-15 minutes. Submitted by Hazel Cumbee. Beat egg yolks slightly. Blend with cheese, salt, paprika, and Worcestershire sauce. 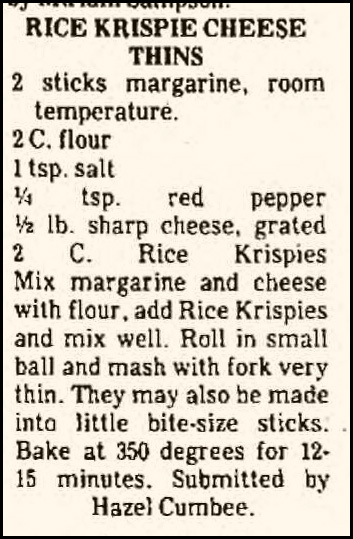 Crush Rice Krispies into fine crumbs. Add half the crumbs to the cheese mixture, mixing well. Beat egg whites until stiff but not dry. Fold in half the egg whites, shape into balls about 1-1/2 inches in diameter. Roll balls first in remaining egg whites, then in remaining Rice Krispies crumbs. Set aside until shortly before serving time. Fry cheese balls in heated shallow fat turning until balls are browned on all sides. Serve immediately accompanied by tomato sauce. To make sauce, melt butter in saucepan; stir in flour. Add milk gradually, stirring constantly over low heat until thickened. Set aside. Combine tomato sauce, bay leaf, sugar and parsley; simmer about 15-20 minutes. Remove bay leaf. Just before serving, stir in soda. Add to hot white sauce and serve at once. Yield: 6 servings, 3 balls each. One more tidbit about Krispies–lots of sources mention the existence of a fourth brother in clan Krispie named Pow (for the nutritional punch), but they’re fuzzy on the timelines, and while it seems like concept art exists, I can’t find a single instance of Pow ever appearing in anything, ever. So sadly, this is not really the Shemp of the Krispies. Work all above with hands until very pliable without sticking to hands. Then add 2 cups Rice Krispies. 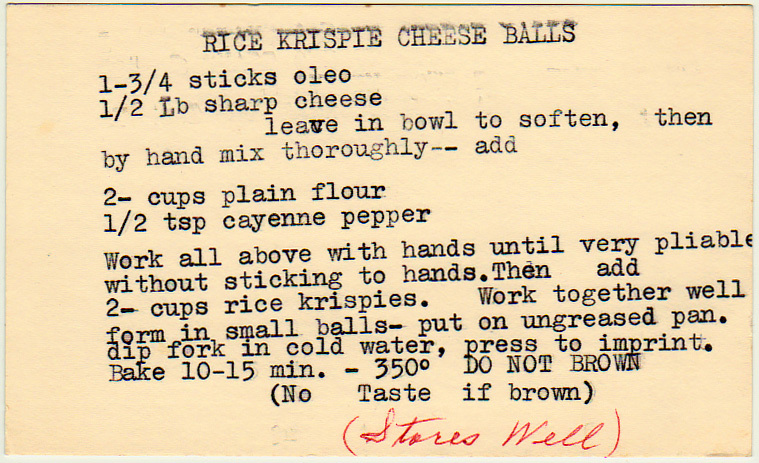 Work together well; form in small balls–put on ungreased pan. Dip fork in cold water; press to imprint. Bake 10-15 minutes — 350 deg. Do Not Brown.